George Weiksner and his father Michael are creating an ethereum-based token that can be used across multiple gaming platforms. George was first introduced to cryptocurrencies by his dad, Michael Weiksner, who has worked in the industry in the past. 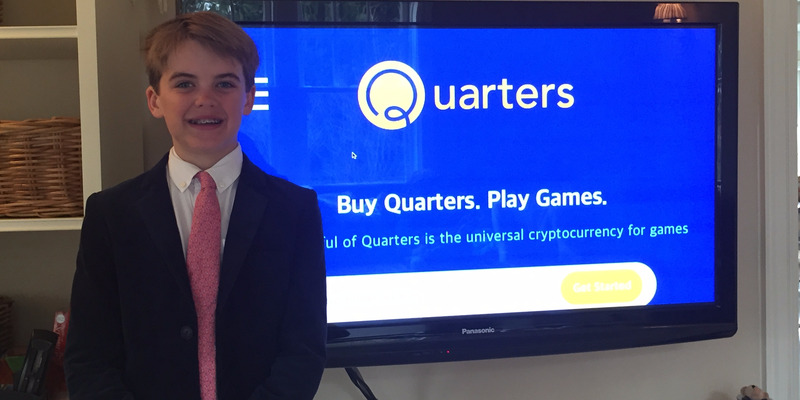 The pair sat down with Business Insider to chat about their new platform, a Pocketful of Quarters, their vision for cryptocurrencies in gaming, and the challenges of making a 12 year old the CEO of the company. George Weiksner was 11 years old when he sat down to discuss dividing up the equity of his new startup with his co-founder, who also happened to be his father. George initially asked for an 80% stake in their cryptocurrency-based gaming platform Pocketful of Quarters, a proposal his father, Michael, balked at. "I said, ‘Let’s do 50/50 because I’m the one that has to build it,’" Michael told Business Insider. George was clearly unhappy with his father’s division of equity and as his father recalls, he got emotional. "My wife was mad at me," Michael said. "She said, ‘This is supposed to be fun.’"
But George considered his father’s counter offer, and in the morning, he was ready to compromise: 50/50, as long as he was granted the final say in company business. "We decided that when it comes down to it, we’ll do it the way George wants," Michael said. In the world of entrepreneurs, there are few co-founders with so striking an age difference as that between George and his father. 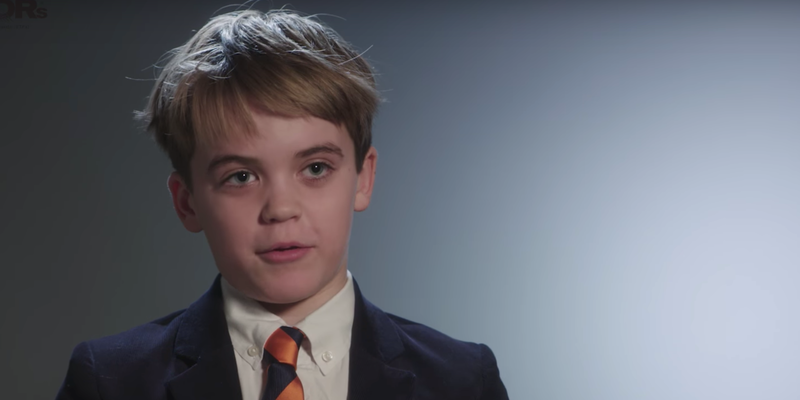 George, who turned 12 in February, is a video game enthusiast who has long taken issue with one irksome aspect of video games that he is hoping to solve with cryptocurrencies. George says the idea for Pocketful of Quarters occurred in September, during a conversation with his dad about cryptocurrencies on the car ride home from school. "At the time, I was frustrated because whenever I quit playing a video game, I lost all of the coins I’d earned in the game," George told Business Insider. "That meant that I was losing all of the work and effort I’d been putting into the games. So when my dad told me about cryptocurrencies, creating a cryptocurrency for games made sense to me." George’s solution is a cross-platform cryptocurrency token that, if it takes off among developers, will be used in the future as an in-game currency. The token, called Quarters, is built on the cryptocurrency ethereum and will soon be available for purchase on the site Pocketful of Quarters, which he says will function similarly to a cryptocurrency exchange like Coinbase. According to the Weiksners’ vision for the token, Quarters could theoretically be used to purchase anything in games — from upgrades to extra lives. While this is the first time Michael Weiksner has gone into business with his son, it isn’t his first venture into the field of cryptocurrencies. A Stanford graduate and entrepreneur who now runs the venture capital firm Rostrum Capital, Michael worked on the bitcoin-based Colored Coins back in 2013. Michael has long been a believer in the potential of cryptocurrencies and blockchain technology, and when his son came up with the idea for a cross-platform cryptocurrency for video games, Michael thought that it could make for a viable business. Michael says it made sense to go into business with his son, even though George was only 11 years old at the time. In many ways, Michael said he sees George’s comparative youth as an asset rather than a disadvantage. "A 12-year-old mind can see the world unpolluted by all of the silly compromises we’ve made, and that’s exactly what happened when I explained cryptocurrencies to George," Michael said. "It was as much for me to get his perspective on something I thought was interesting as it was for him to teach me about something that I think is the future." While Michael sees his son’s age as an advantage, some potential investors they approached haven’t felt the same way. When the pair tried to enter Pocketful of Quarters into the New York-based incubator Techstars, Michael said that George’s age was a barrier. At first, he said the Techstars team seemed interested in the project, but eventually, "they put their foot down." And while the Weiksners offered to change George’s title from CEO, Michael said the Techstars team was firm when it came to George’s age. "They said they couldn’t have a 12 year old in the program." In an email to Business Insider, Techstars managing director Alex Iskold said that Techstars passed because Pocketful of Quarters was pre-launch and had applied after the new group of companies had already been selected for the incubator’s upcoming term. However, he did say that the team had found George’s age to be problematic. "I think there are certainly challenges and potential liabilities with having an 11-year-old CEO and we had questions around that," said Iskold. "Why can’t a 12 year old be CEO?" Michael asked during a phone call with Business Insider. "We have 12-year-old actors and 12-year-old athletes. Why can’t we have 12-year-0ld entrepreneurs?" When George and Michael visited Business Insider’s New York headquarters, he stopped short as he passed a framed photograph of Elon Musk hanging in the corridor. "Oh my god!" he exclaimed. "Is that Elon Musk?" I confirmed that it was a photo of Musk taken during an interview with Business Insider. "Wow!" He said. "My little brother is going to be so jealous." During the course of the interview, George sat upright on the sofa as he chewed ice from a plastic cup and explained his deep enthusiasm for cryptocurrencies and blockchain technology. Over the past few months, George has regularly attended several cryptocurrency meet-ups in New York with his dad, and, contrary to what one might expect from your average 12 year old, George said he never found the meet-ups to be boring or beyond his comprehension. "I think it’s really interesting," he said. "The funny thing about crypto is that there’s so many different people involved. There’s nobody that’s like, ‘I went to college and studied crypto.’ Everyone is from a different background." At these cryptocurrency meet-ups, George said that he is always the youngest person there. When George meets other conference attendees, he said they often play what he called "the cute game" at first — dumbing down the conversation a bit as they realize they’re talking to someone far younger. But George said he’s treated more seriously once he describes his idea for Pocketful of Quarters. It’s clear that George knew a lot about blockchain-based technology, the notoriously puzzling digital ledger that has warranted explainer columns in news publications from Business Insider to The New York Times. George said he doesn’t think that age should be an impediment when it comes to understanding the blockchain. "I think that if anyone puts the time and effort into learning something, they can do it," he said. "If you educate yourself on the blockchain, you’ll understand it. Anyone can do that if they have the time." The conversation with George made it apparent that cryptocurrencies, which were once a topic relegated to a close-knit group of Redditors and cypherpunk forums, have seeped into the mainstream consciousness even among middle-schoolers. At school, George said that the concept has come up multiple times in conversations with his classmates, and that the majority of his classmates have a rudimentary understanding of digital currencies. His father has been an active figure in George’s education on the blockchain, and Michael said that he emphasizes the importance of learning about coding and cryptocurrencies for all four of his children. "I teach my kids to code," Michael said. "I think it’s very important to understand what the future might look like, and I’m very interested in their feedback." 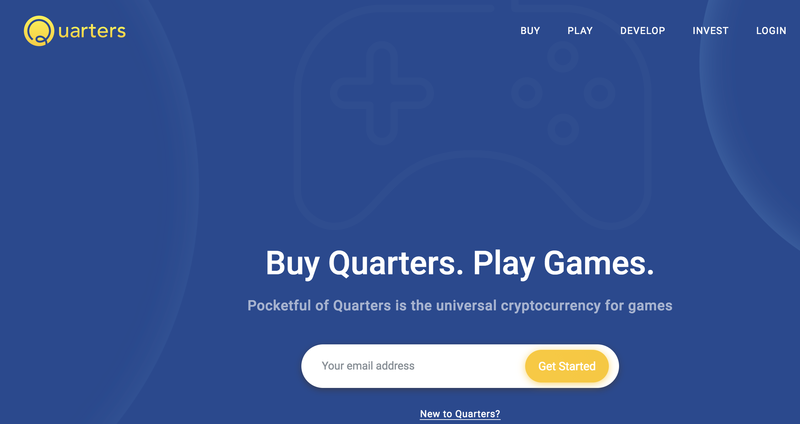 George and his father believe that Pocketful of Quarters’s emphasis on creating a solution for video game players sets their project apart from other in-game cryptocurrency offerings. "Our focus is on the players," said Michael. "That’s what makes us different from what’s out there. All of these other gaming industry people who one way or another feel the pain of developers and publishers don’t feel the pain of the players in the same way." And to anyone who might believe that making a 12-year-old the face of a company is clearly a clever marketing strategy, George and Michael flatly deny this motivation. When I ask if George’s involvement in Pocketful of Quarters is largely as a figurehead, he emphatically disagrees. "I came up with the idea," he said. "Yeah," his dad affirmed. "It was his idea." "I came up with it, and I have a clearer vision than my dad does," said George. "Whenever we go to crypto meet-ups, my dad babbles about it for ages and ages and he won’t really get to the main point." What’s the main point? I asked. "That it’s frustrating whenever you quit a game because you lose all of your coins," George said. "My dad just likes getting into the software." While Pocketful of Quarters may have met some pushback from investors — the pair is currently trying to fundraise — Michael said that most of the people he meets are intrigued by the fact that he’s starting a business with his young son. "Mostly, people think it’s cool," Michael said. "My friends know George and they believe in George. It all comes down to the fact that when you launch a cryptocurrency, if it’s successful, it’s unstoppable." He references Vitalik Buterin, who learned about bitcoin from his own father and began working on the creation of what is now one of the world’s most influential cryptocurrencies, ethereum, when he was only 19. "Vitalik said that even a 14-year-old could launch a new currency," said Michael. "George is 12, so: close enough." The new standard was introduced this week by the Joint Photographic Experts Group, which says that the aim of JPEG XS is to "stream the files instead of storing them in smartphones or other devices with limited memory." So in addition to getting faster HD content on your large displays, the group also sees JPEG XS as a valuable format for faster stereoscopic VR streaming plus videos streamed by drones and self-driving cars. "We are compressing less in order to better preserve quality, and we are making the process faster while using less energy," says JPEG leader Touradj Ebrahimi in a statement. 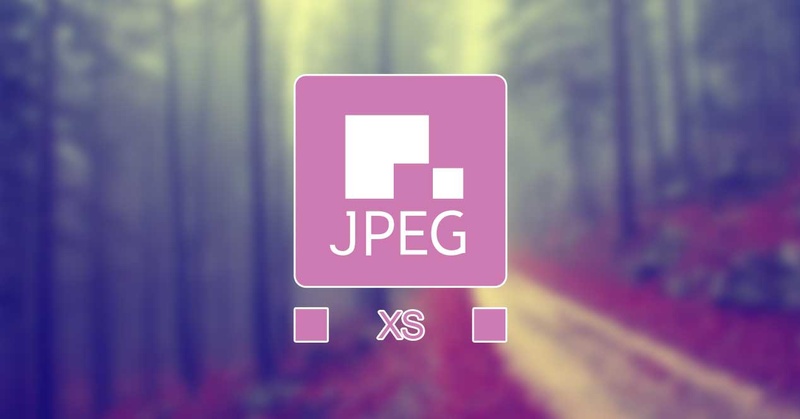 According to Ebrahimi, the JPEG XS video compression will be less severe than with JPEG photos — while JPEG photos are compressed by a factor of 10, JPEG XS is compressed by a factor of 6. The group promises a "visual lossless" quality to the images of JPEG XS. Consumer electronics like "self-driving cars, virtual reality, augmented reality, and wireless connections between multimedia devices and TV monitors or projectors" will be next, according to Ebrahimi.